Worldwide, as well as here in Australia, inadequate pool fencing continues to be one of the major contributing factors in the accidental death rate of children under age 5. Since 1990, New South Wales continues to make considerable progress in reducing the rate of drowning among youngsters and recently amended the Swimming Pools Act of 1992. The new safety standards amendment provides for mandatory pool ownership registration and random assessments for conformity or face a fine for non compliance. While the penalty reported varies among localities, it’s clear they government is cracking down. Drowning is a leading cause of accidental death in very young children who lack the cognitive and water skills to deal with the danger. With over 300,000 backyard swimming pools in NSW, swimming pool safety is a vital issue that affects the whole community. In 2012, a comprehensive review of the Swimming Pools Act 1992 was finalized. This review identified a number of amendments designed to enhance the safety of children under the age of five years around private (‘backyard’) swimming pools in NSW. If you’ve made the decision to buy a pool, in ground, above ground or inflatable, we encourage you to read the above article from the NSW Division of Local Government for your families safety as well as your friends and neighbors. The new pool fencing regulations and swimming pool information brochures are also translated in 15 languages. It’s easy to forget the laws and the reasons for them as well as the ramifications and tragedy of accidental death while we are thinking of what fun we can have in a new pool. Drowning accidents among young children are for the most part, preventable. Pool fencing and gates, designed to save lives by providing an enclosure (or a barrier), only works when properly maintained and used as designed. And that isn’t all. The pool owner must make sure that there are no climbable objects near the fence. You must, by law, have a four sided fence around ANY pool that can be filled with more than 300mm of water. This includes inflatable and portable swimming pools. The maintenance of pool fencing is extremely important, even if you do not have young children living at your home. Children are most at risk of drowning within 6 months of moving into a new property with a swimming pool,5 or when visiting the home of a friend, family or neighbour with a pool. While many states and territories in Australia have enacted pool fencing legislation, each locality may differ in requirements as well as exemptions. While these exemptions are rare, they are often misunderstood when it comes to prefabricated pools. Many above ground or inflatable pools are installed without fencing. 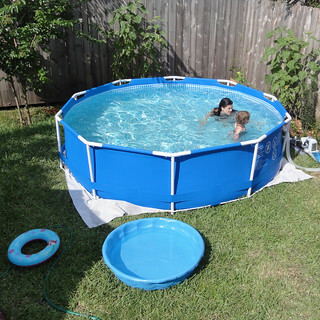 Drowning accidents and resulting law suits prove fencing around these types of temporary pools are often an afterthought of a spur of moment purchase, especially in regards to inflatable pools. Prefabricated and inflatable pools capable of being filled with water to a depth 300mm or more may require approval but more importantly, require child-resistant barriers to prevent access to the pool by children. Swimming pools must be separated from a residential dwelling by a child resistant barrier. From 1st July 2010, swimming pools located on properties which are waterfront, on land over 2 hectares or on very small properties (230m2 or less) can no longer use the automatic exemptions from the Swimming Pools Act 1992 (Act). Be sure to visit this link for a thorough read of the prefabricated pool fencing requirements. An earlier section of the pool fencing law refers to older pools built before 1990. Instead of a fully formed fence, one side of the barrier could actually be the wall of a home or other structure. In this case, the enclosure does not fully act as a barrier to those within. Adding to the danger, the enclosure may include a window or door. In this case, an exemption would naturally occur, but child proof doors and windows are required. This type of barrier is forbidden after 1990. There are different fencing regulations for pools built between 1990 and 2010 as there are after 2011, not including the recent amendment of 2013. There are specific requirements for the doors leading to a pool as well. This list is a short sample, please visit the accompanying links for a full understanding of the NSW Pool Fencing Laws. All pools installed after 1 August 1990 excluding pools on very small properties (less than 230 m2), large properties (greater than 2 hectares) and waterfront properties. Home pool safety checklist – small properties – All pools installed on very small properties (less than 230 m2); and all pools installed before 1 August 1990 excluding pools on large properties (greater than 2 hectares) and pools on waterfront properties. Violation of pool fencing regulations come with a stiff penalty that can be better spent on pool toys. Because these fencing measurements are not recommendations, rather a law for which you can be fined $220 to $ 1,100 ($5,500 in the above article from NSW.gov au). Ensuring that the pool is at least 1200mm (1.2m) all the way around. If a boundary fence forms any part of your pool fencing, the boundary fence must be at least 1800mm (1.8m) high and have no footholds that allow children to climb the fence and get into the pool. Swimming pool fences must be kept in good repair with no breaks, holes, gaps or other damage. No objects should be placed within 900mm (90cm) of the pool fencing so that children can use them to climb over the fencing. These include pots, barbecues, trees, plants, furniture and the like. Swimming pool gates must open outwards and should be self closing from any open position. The location of the gate latch should be on the inside of the pool fencing so that you reach over to access it. A resuscitation sign should be displayed immediately around the pool area. Any pool or water feature that is deeper than 300mm (30cm) when it is filled must have the appropriate safety fencing installed. The above summary is not an all inclusive list of fencing stipulations, but it does link to helpful resources. As with most regulatory wording, there are times when application of the law regarding your specific situation may be in question or confusing. Members in a homeowners forum are in disagreement or totally baffled by the new law. Some call it far reaching, while others find it a welcome solution in saving children’s lives. Because the pool fencing laws differ among localities, there is some confusion when residents move to a new areas, whether inside NSW or within Australia. Are fenced barriers enough to exclude the pool area from unsupervised children? Unfortunately, no; there no substitute for adult supervision. Unforeseen events occur, we can only try to be as proactive as possible. In the instance of climbable objects, this refers to anything near the fence that would allow a child access. The law stipulates a non climbable zone around the pool fence. An out-of-place pool ladder leaning against a fence; pool filters or pump houses outside the fenced area, yet aligned with the fence, can be climbed. Anything allowing a child to scale the fence; it could be a shed, a stack of boxes, even a clothesline. Kids are resourceful, sometimes even to their own detriment. In the case of housing tracts where yards are small and close together, pool owners should be alert to older daring kids jumping into the pool from roof tops, dividing yard fences or other structures. If you’ve been around kids, then you know, anything is possible. Being a proactive pool owner can be tough, just ask Kegaro from Grafton, in the Northenrstar forum. It’s impossible to imagine every accident that might occur, especially when the pool is closed for the season. Covered or not, it’s still a hazard waiting to happen. Double checking the area regularly for possible access seems like common sense, but easily forgettable—a nightly reminder of some sort might help. There were strong calls for new regulations after six children drowned in their family’s swimming pools across the state last year. The 2010 Annual Report from the NSW Child Death Review Team showed that almost half of all child deaths from drowning occurred in pools with faulty fences or gates. In addition, each year an average of 36 children suffer permanent brain injuries from swimming pool accidents in New South Wales. “It is totally unacceptable that NSW is overrepresented in national backyard swimming pools statistics,” the Local Government Minister Don Page said. Does your fence need repair? Check your gate latch for effectiveness. According to law, the gate to the pool must also be hung in a specific manner. If the gate latch is broken you must permanently fasten it in some manner until it can be repaired. Your fence may need repair if it has loose or missing fasteners, bolts, screws or other issues. A pool fence is not a set and forget project as much as we would like it to be. If you are short on time, have a professional fencing company take a look at it. And lastly, a recent post at the City of Newcastle is invites all swimming pool owners to join the pool register. NSW Swimming Pools Register available for use by 29 April 2013 – Note this will be a separate register to the one shown on this page. Pool owners require a compliance certificate before sale or lease of their property from 29 April 2014. For advice on New South Wales pool safety requirements or pool inspections , contact your local council. Walter’s Chainwire Fencing, a licensed pool fencing contractor for over 15 years, would be honored to assist you with any concerns regarding fence repair, maintenance or installation.